Missing the good old days? Watching the news and shaking your head at the state of the world? You’re not alone. Humans have a tendency to see the past as a better place, where people were kinder, the sun shone brighter and life was just that little bit easier. There’s a reason for that – more of which shortly. But first, here’s proof that however pessimistic you might feel about the state of the world, in many ways, we’ve never had it so good. The media loves conflict. It can often seem like war is everywhere. And, although there are still many bitter conflicts around the world with serious impacts locally and internationally, the fact is, things used to be a lot worse. 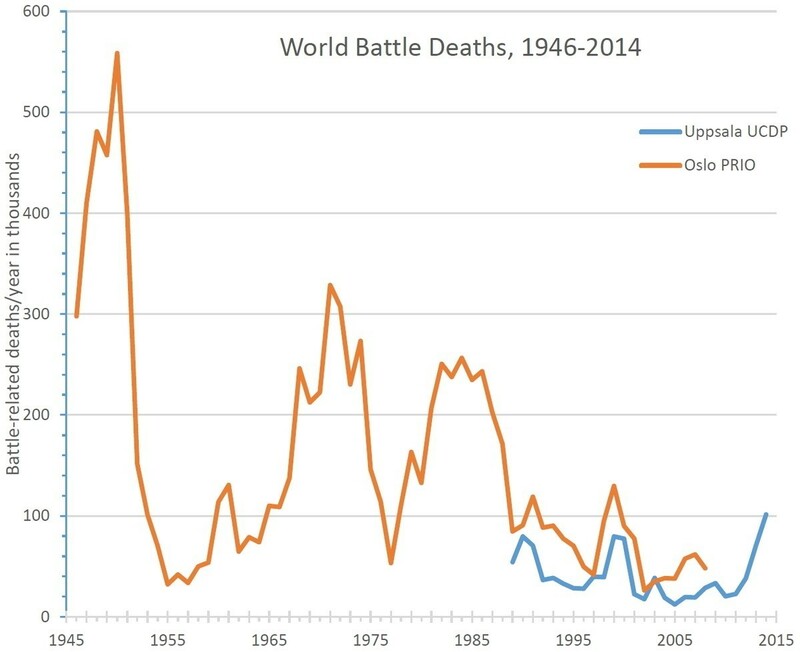 This chart from University of Uppsala’s Department of Peace and Conflict Research Unit shows that deaths in battle are low in comparison to almost any period since the Second World War. As well as a fall in the number of deaths in battle, there has been a dramatic rise in the number of democracies around the world. 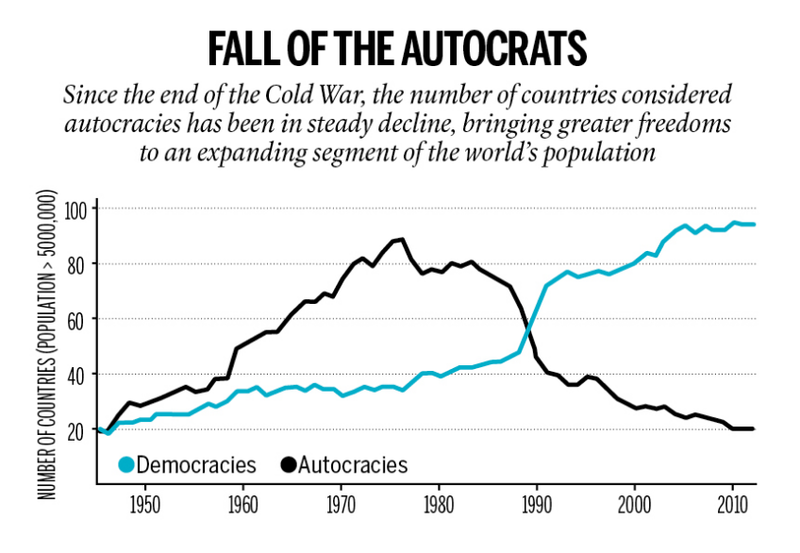 Again, no one is claiming that everything is rosy and there is still a great deal of pressure on the newer and more fragile democracies around the globe, but since the early 1990s there has been a larger number of democracies than autocracies. That has to be good news. It is not just deaths in battle which have declined dramatically. Homicide rates have also fallen sharply. Defined as “an unlawful death deliberately inflicted on one person by another person outside of war and genocide”, homicide rates have decreased enormously over the last millennium and have remained steadily low over the past 50 years. This chart shows five regions within Europe but the trend is visible worldwide. This chart is from a paper by economist Branko Milanovic. It shows how income has grown or shrunk for people at various points on the global income distribution. Most of the world has experienced absolutely huge gains. Except for the very poorest countries, the world’s poor have become a lot less poor. This is true of people in middle-income countries such as Russia, Malaysia and Brazil, and of people in most impoverished African countries as well. And nowhere is it truer than in the newly industrialized China. Middle and lower-middle classes in rich countries have not fared as well, as inequality in richer countries has increased. But in the world as a whole, there are many, many fewer poor people today than there were even 20 years ago. So let’s return to the belief, common in many countries, that things are getting worse. Declinism refers to the belief that a nation or some other institution is in decline. Today declinism in the United States is fashionable with many politicians. Donald Trump’s campaign slogan for the 2016 Presidential Election nomination election is “Make America Great Again!” The campaign for the UK to leave the European Union promises the same type of return to glory. One interesting explanation for declinism is that it is the result of the way we encode memories and access them in later life. In old age, memories from our lives are not evenly distributed but instead concentrated in two regions. These are memories formed in adolescence and early adulthood and our recent memory. The following figure is a useful representation of this. With the passing of time we tend to remember positive experiences over negative ones. So while our recent memory has plenty of negative experiences, the memory of our early adult life has fewer. That’s why life can seem so much better "way back when". While there is certainly no shortage of things to worry about today, many long-term trends are positive. How optimistic are parents about their children’s financial future? will.i.am: "Let's put our optimism goggles on"
Which countries have the happiest children?